A front page slide show is one of the easiest ways to turn your static website into a dynamic website. Ideally, your slideshow should combine text with images. 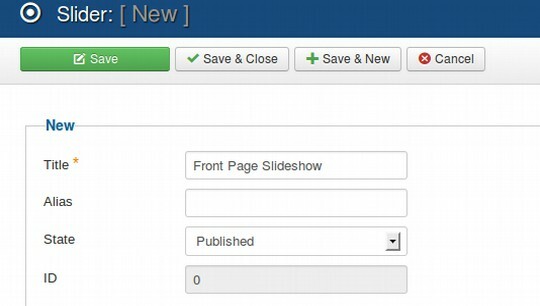 Sadly, most Joomla slideshows lack an easy way to add foreground text over background images. In this section, we will show you how to add a free Joomla slideshow which not only allows you to combine text over images, but to control both the color and font size of the text to match your slides and your website. The structure of a modern website includes a header at the top of the page with an image and a slogan which tells the viewer what your website is about. Think of the header as being like the cover of your book. Below the header is a horizontal main menu which acts as a Table of Contents for your website much like nearly all books begin with a Table of Contents. Below the main menu is a slideshow which has two important functions. First, because it is constantly changing, it brings life to your Front Page. Second, it can draw the viewer in to your website by offering a visual summary of why the viewer should spend more time reading the pages on your website. The slide images and text are a listing of the features and benefits of your website. Putting a slide show on your HOME page is one of the best ways to get viewers to spend more time on your website. A slide show with its rotating images changes your website from a static site to a dynamic site. A slide show uses a series of images to create a visual story which will tell viewers what your website is all about and why they should recommend your website to their friends. A slideshow is a great introduction to your website. The problem with most free Joomla slide show extensions is the difficulty for adding text over images. This simple extension is one of the best at combining text over images in a simple format. The Unite Nivo Slideshow is a responsive slider meaning it displays well even in mobile devices. The slideshow also has the ability to display inside of an article. Click on the DEMO to see the slideshow. Then click on Download to download the free slideshow component and module. Next transfer these two extensions from your download folder to your website extensions folder. Then log into your Joomla Control Panel and go to Extensions, Extension Manager to upload the component and then the module to your website. Then click on Components, Unite Nivo Slider. Click New to create a new slider. Give the slideshow a title. Then click Save and Close. Unite Nivo Slider is a responsive slideshow in that the images automatically get smaller as the browser window gets smaller. But you should create the slideshow for the maximum width of your template. We have set the Design Control template to have a maximum width of 980 pixels.. Subtracting 20 pixels of padding on the right and left sides of the screen, this means our slideshow images should be about 940 pixels wide. Leave room for a small border on the sides and top and a bigger black border on the bottom to display readable text. The height of each slide should be about 250 to 300 pixels. All slides should have exactly the same height and width. After saving your images be sure to optimize all of them by reducing the file size to under 100 KB each. Here is the first image in our slideshow. It is 940 pixel wide and 250 pixels tall. How many slides should you create? Connecting People… Our goal is to change the world by making it easier for everyone to form online communities – using free open source tools! Start with a Solid Foundation… We build our Interactive Website on the Joomla framework - one of the world's most secure and well organized web building platforms. Build your website using simple interfaces… no need to waste time trying to learn complex computer programming. We use a Flexible Template... that allows you to place any content in any location on any web page and change font and background colors with just the click of a button. Add your own custom header image and slogan in a matter of minutes. Share Your Ideas… Learn how to build your own community blog and connect it to Facebook. Add a free responsive slideshow….with images that adjust to display correctly on any computer screen, any tablet or mobile device. Organize Interactions… With an automated Feedback System to encourage questions & suggestions – and insure all comments are answered in a timely fashion! Let's Get Started! Whether your goal is to build a local community or start your own online business, we can help you create your own interactive website! After deciding on the text message of our slideshow, we need to create an image to act as a background image for these 9 sentences. 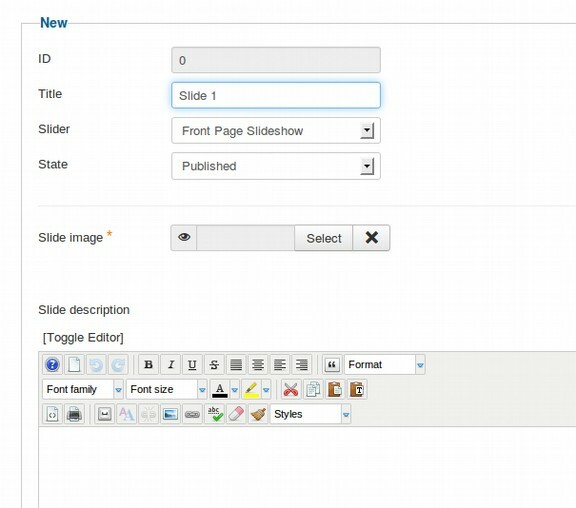 Once you have made your slideshow images, go to Content Media Manager and create a folder for your slides called frontpage_slideshow. Then upload your images to this slideshow. It is useful to include the dimensions of the images in the image file name. But remember that image file names must be lower case with no spaces. Here our images after being loaded into the media manager. Go to Components, Unite Nivo Slider and click on Edit Slides. Click New to add your first slide. Give your slide a title. Then click Select to select the first 940x250 image from the slideshow folder in your Media Manager. Then if you have not already included text in the image, give the slide some descriptive text. Then click Save and Close. Repeat this process for your remaining slides. Next, go to Extensions, Module Manager and open the Unite Nivo Slider Module. Hide the slideshow module title. Select the module position you want the slideshow to appear in. We have used the Design Control Top Row 2 for our slideshow. Then go to the Menu Assignment tab and select the pages you want your slideshow to appear on. Assign the module to just appear on the HOME page. Then go to the General Settings tab and set the width and height of the slideshow. Raise the pause time to 6000 to 9000 to slow down the transition between slides to once every 6 to 9 seconds. For custom effects, select a transition effect such as Fade. Click on the Advanced Tab. Set Jquery for Yes. Nivo_slider.js for Body and No Conflict Mode to No. If the first slide shows, but not the rest, on the Module Edit, Appearance Settings tab, set Control Nav to True and Direction Nav to False. Recheck all of the module settings. Clear your browser cache and reload the page. Then view your new slideshow. We now have a slide show in a module on our Home page. In the next article, we will review how to add a slide show to an article. Keep reading to find out how it is done!